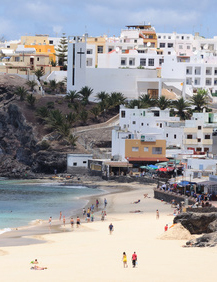 Holidays to Fuerteventura are a great holiday choice at any time of the year. The amazing climate and the beautiful beaches - the best in the Canary Islands continue to attract more and more visitors each year. The island's beaches are quite contrasting; from the impressive sand dunes at Corralejo through to the white beaches of Costa Calma. The largest beach on the Jandia peninsula stretches for mile after deserted mile. Sun worshipers flock to Fuerteventura to bask on these impressive sands, swim in the crystal-clear waters, and try their hand at a wide range of water sports. Every year countless surfers, windsurfers and divers descend on the island to enjoy their sport. Luxury holidays to Fuerteventura can be found in the many 4 and 5 star hotels located in the island's resorts the most popular resorts with British holiday makers are Corralejo and Caleta de Fuste. 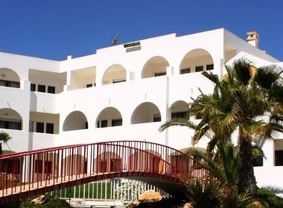 In recent years the quieter resorts of south Fuerteventura, Costa Calma, Morro Jable and Jandia have also seen a controlled development with the introduction of more good quality accommodation. Whether you are looking for a cheap last minute holiday, an all inclusive family hotel or a luxury 4 or 5 star property,Fuerteventura has a wide choice of hotels and holiday accommodation to suit everyone. Holidays to Caleta de Fuste are popular all year round, the resort lies on the east coast of the island, only a convenient 15 minute taxi ride from Fuerteventura airport. The wide horseshoe shaped beach here is a main feature of holidays in Caleta de Fuste with its gently shelving golden sands making it ideal for children and family holidays. There is a good choice of apartments and quality hotels and if you are looking for a little bit of luxury on your holiday in Fuerteventura then there are several top class 4 star (plus) hotels and the 5 star Sheraton Fuerteventura available in the resort. 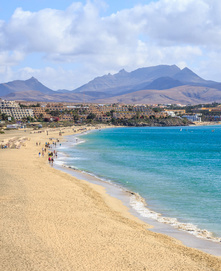 Holidays to Corralejo remain a firm favourite with UK holiday makers with more and more visitors choosing to holiday in Fuerteventura's busiest resort. 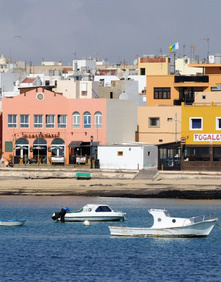 The increase in visitor numbers has prompted the development of Corralejo, with new hotels and apartments springing up each year to satisfy this demand. 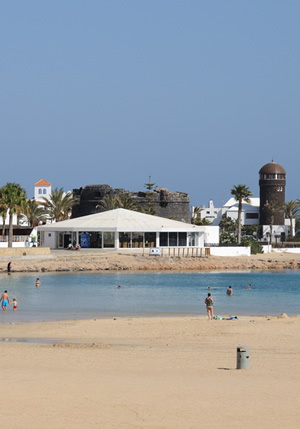 A Holiday in Corralejo has changed over time as the resort has grown from what was a sleepy fishing village into a lively popular holiday resort. The resort however has managed to retain a good proportion of its original charm and atmosphere, and there are still white sandy beaches in the town centre, where you can relax and soak up the Canarian sunshine. Set on the Jandia peninsular 100 kilometres from the islands airport on the southern tip of Fuerteventura lie the resorts of Morro Jable & Playa de Jandia. The old fishing port of Morro Jable and the neighbouring new resort of Playa de Jandia have developed over the last few decades so that they have almost merged into one large resort. The glorious beaches stretch for miles and the area is a magnet for beach lovers and windsurfers. The port of Morro Jable is home to a small fishing fleet and several pleasure boats, from here you can also take the jet foil to Gran Canaria. To the south of the resort is the Playa de Sotavento beach this huge beach stretches all the way (around 12 miles) down to Morro Jable. This beach does get breezy and attracts windsurfers from far and wide.